The post From TOWIE to Dancing on Ice: Gemma Collins IS the queen of reality TV appeared first on CelebsNow. 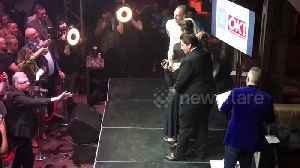 A girl won a charity auction for cancer research at James Ingham’s fundraiser in London, for a photo on stage with reality TV stars Gemma Collins and James Argent. Gemma Collins reveals plan to move Stateside The reality star is sick of the UK and is planning to move to Los Angeles. Gemma, who originally found fame for her appearances in 'The Only Way Is Essex',..
James 'Arg' Argent was pictured turning up to Gemma Collins' house this week, and it's said the reality star begged for forgiveness after their recent breakup. NFL's TYREEK HILL, 'My Son's Health Is My #1 Priority' PATRICK MAHOMES Lands Madden 20 Cover, Chiefs Fans Nervous? ?